Photo by Autumn Walter |CIGAR| After six years at the helm of URI’s men’s basketball team, Dan Hurley will officially sign a contract with the University of Connecticut. 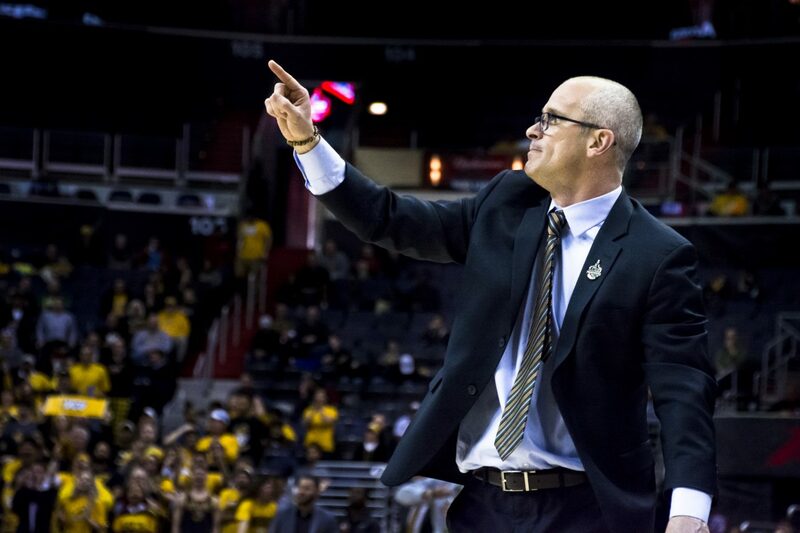 After six seasons as the head coach of the University of Rhode Island men’s basketball team, Dan Hurley is departing for the head coaching vacancy at the University of Connecticut. A national search for the University’s next head coach will begin immediately, according to a press release. Rhode Island’s athletic director Thorr Bjorn said on Thursday afternoon that his goal is to have a new head coach selected in two to two and half weeks. Hurley has inked a six-year deal to be the Huskies new head coach. He replaces Kevin Ollie who was fired by the University on March 10 after missing postseason play and failing to win more than 20 games over the past two seasons. Hurley’s contract is reportedly worth over an average of $3 million per year with him making $2.75 million in year one. That number is strikingly similar to the number the University of Pittsburgh offered Hurley to fill their head coaching vacancy. Rhode Island did make a strong push to keep Hurley as their head coach. ESPN’s Jeff Goodman reported Thursday morning the specifics of Rhode Island’s offer which included an increase in salary and advancements to the men’s basketball program. Goodman reported that URI’s offer was $2 million per year for seven years starting in July of 2019. In also included a 24-month plan for a men’s basketball specific practice facility as well as salary increases for his assistant coaches and team charters to all away games, per Goodman. Tom Moore, current Rhode Island assistant and former UConn assistant under Hall of Fame coach Jim Calhoon, is expected to stay on Hurley’s staff at UConn. Rhode Island’s current associate head coach David Cox is the “head coach in waiting” for URI according to CBS Sports’ Jon Rothstein. Cox is responsible for the recruitment of student athletes such as Jeff Dowtin, Cyril Langevine and incoming ESPN top 100 recruit Jermaine Harris who chose Rhode Island over the likes of West Virginia and Xavier. Bjorn said that Cox is the only candidate that he would mention by name. After leading the Rhode Island Rams to back-to-back NCAA Tournament appearances and 25-win seasons, Hurley brings an impressive resume to Storrs, Connecticut. Before Hurley arrived in Kingston, Rhode Island has not made it to an NCAA Tournament in 18 years. Under Hurley the Rams won their first Atlantic 10 Championship since 1999 and their first A-10 regular season title in program history. Hurley leaves Rhode Island as the only head coach to win games in the NCAA Tournament in consecutive seasons. He is also only one of four coaches to bring Rhode Island to the NCAA Tournament, joined by Tom Penders, Al Skinner and Jim Harrick, whom all went on to coach bigger programs after leaving the University.